anyone have this combo to test with? I replaced my broken DC with a sega sports DC but there's something wrong with the A/V port (the toro cable will not go all the way in like it would on a white dreamcast). Because it does not fit all the way in, I get either a green screen, 524i resolution or sometimes 1431i resolution. I cannot get 524p at all. I have this setup. The Toro AV cable does need more force to insert than the stock composite AV cable, and it's possible that the AV port on your Sega Sports DC has suffered far fewer insertions than your old one. Make sure the port is clear of debris, perhaps get in there with an isopropyl-alcohol-dipped toothbrush (obviously disconnect the power and discharge the PSU with the power button before brushing, and let dry before reconnecting power), then try again. I had to chip off some stuff inside the a/v port that I did not see earlier. I am getting video now. though it is driving me somewhat nuts, I was sure through SCART I was achieving 480p (or 524p) on my old dreamcast. On this one I cannot and I am only seeing 524i. If I switch to VGA I can see my ossc reporting 524p but I get no signal. Do you have another DC to try the Toro with? I had similar issues with my Hanzo until it stopped working altogether. BeharBros sent me a new connector FOC and that solved the problem. Typical Dreamcast SCART cables won't get you 480p, because the Dreamcast only outputs 480p in RGBHV, and SCART is built around RGBS; you'd need a custom/aftermarket cable with a mode switch and an inline sync combiner, or a BeharBros Toro, to get 480p over SCART. How are you connecting your Toro to your OSSC (I'm assuming it's an OSSC)? VGA? SCART? And what input/mode on the OSSC are you selecting? The dreamcast is going to a toro box, which is going from SCART to a bandridge (which goes to the OSSC). The OSSC is on AV1. Right now I can't remember what the mode says but it's 100% the first AV1 option. That simplifies things. The SCART output on the Toro always outputs RGBS. Since you're getting sync, I expect the OSSC is on the correct input (AV1-RGBS). Since you're getting an image through the Toro when the mode switch is set to 480i, it sounds like everything from the SCART cable downstream is fine, as is the connection between the console and the Toro. If you then flip the mode switch to 480p and restart the console, and that results in sync but no image, I would think that either the console or Toro is at fault. If you have the budget for one of the cheap, garbage VGA cables (quality doesn't matter; just needs to work), you can use that to test 480p from the black DC--if you get an image, then the console is fine and the Toro is faulty; otherwise the console is faulty and the Toro might be faulty. Alternatively, if your old DC still powers on and shows its home menu, you can use that to test the Toro. 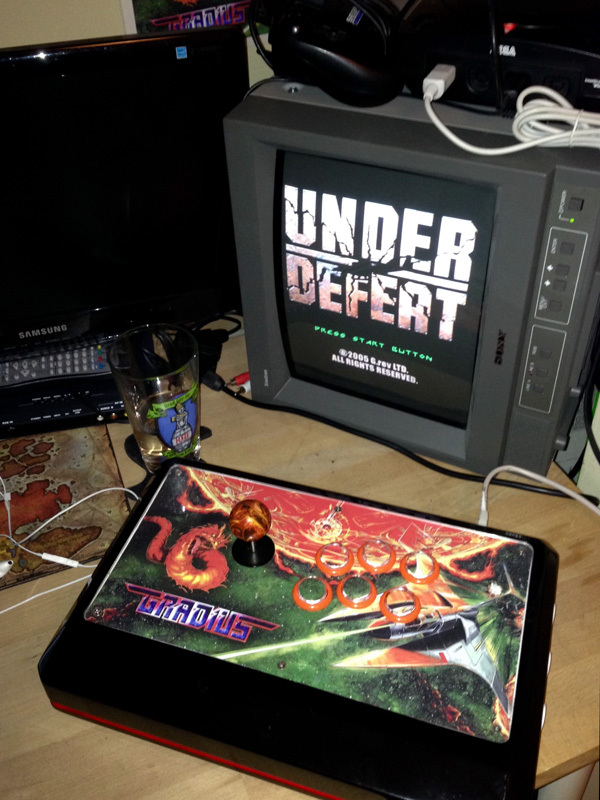 Set the Toro for 480p, hook it to the old console, and power it on--if you get an image, then the Toro is fine. There's nothing special or different about the Sega Sports model Dreamcast. It's the same as a white Dreamcast. It works fine. No difference in using a White Dreamcast. Here's my Sports Edition connected to a PVM using the Toro. I found a VGA cable in my closet. Using it on the Toro to my OSSC I can see my dreamcast in 480p on AV3 RGBHV. I was certain that I achieved 480p before through SCART, but maybe I was just imagining this? I saw it before but maybe it was on my CRT before I had the ossc. Does Toro -> SCART -> OSSC not support 480p at all then? And what a world of difference 480px2 makes on the DC. It does support 480p through SCART, that's pretty much the main point of the Toro. I'm assuming you tried it but do you have the switch on the Toro in the right position? "RGB/VGA switch to select the 15khz RGB mode or the 31khz VGA mode"
It supporting 31khz over scart is the whole point of the device. The little cable that connects the Toro to the Dreamcast is also a common break point. They are stupid sensitive. If I so much as give it a funny look I lose audio in the right channel. I don't get a signal when I flip to VGA (when viewing AV1 which is my scart connection). Only when I have it on RGB. So at this moment I can only get 480p through vga. Well there is your problem. Dreamcast won't output 480p via RGB. You need to choose VGA on the Toro and it will send that signal through the scart cable. AV1 on your OSSC should see it as RGBS 31khz. If the OSSC isn't getting the signal make sure you test the connection directly, without the switch. my bad but I think I wasn't clear enough. The ossc on AV1 reports 524p/31khz on AV1. It's just that I get no image on my TV. This is what I meant by no signal earlier. That's interesting. OSSC reports the signal but won't display it. If the Toro was to blame you'd think the OSSC wouldn't confirm the signal. Have you tried the Toro on another Dreamcast? Also did the standard resetting your OSSC settings to default? It shouldn't be a problem with the black sports edition. That's a really popular color. I hope you get it going. If it's the port I 'd wonder if someone took it apart before. I've certainly gotten a lot of ebay purchases that were someones amateur repair attempt and then just thrown back together. People who try and pass those off are real jerks. Yes, please do that; that's what I was suggesting on VGP. You just need the console to boot to the home screen to verify that the Toro is working. And don't forget that you can mod your old Dreamcast with a GDEMU; won't be able to play your disc games, but it'll be quieter and games will load a little quicker. same thing happens with my old dreamcast..
but with the VGA solution I am using now, I think I am happy. I can stick to AV3 using vga on the toro. Don't forget that you'll need to change the 480p in sampler setting to DTV 480p to get the correct aspect ratio from the Dreamcast. Bucko over at VGP makes a pretty good argument for using Scart. No benefit if you're only playing 480p games. 1 – Dreamcast games running in 240p and 480i will benefit from the low-pass filter available on the AV1 input but not available on AV3. 480p games will not be affected either way. 2 – AV1 is set to automatically default to 480p rather than 640×480. 480p is the correct setting for Dreamcast (though you should also change the advanced timings as per the wiki for best results). 3 – Interlace running on AV3 works, but it’s kind of a hack and it can cause problems, no such problems on AV1. 4 – The timings for H&V sync seem a little strict on AV3 and some users have complained this causes image drop outs (this is a theory as I’ve not been able to replicate it personally).